Are you prepared for winter? And, by that, I mean fully prepared? Getting ready for the wintry months ahead requires a significant shift in vehicle, mind and soul. Well, maybe just those first two. Point is, properly equipping your vehicle is just as important as possessing the necessary winter driving skills to safely handle changing road conditions. If you think you’re already prepared, great… Prove it! 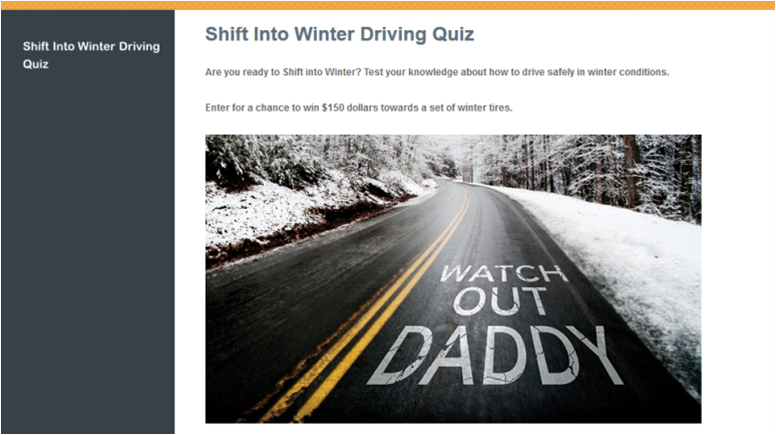 Take the Winter Driving Safety Alliance five-question multiple choice quiz and be entered to win $150 towards a new set of winter tires. Be sure to take the quiz before December 2, 2013 to be entered. Good luck! Since the Transportation Ministry obviously knows that winter tires are the only (relatively) safe option on snowy roads, why are they not mandatory for rental cars driving inland in winter? Rental cars driving inland for the winter are subject to the same requirements as any other car. They should have tires with either the M+S symbol or mountain snowflake and a minimum of 3.5 mm tread. If they do not have these tires they will be required to carry chains and be prepared to use them on mountain passes. Hope that this helps!